Credential Requests: Media members requesting a daily media credential should contact Shawn Murnin no later than 24 hours prior to the game you intend to cover. Credentials can be picked up at the Suns Ticket Office Will Call window. Media credentials grant access to only the named bearer of the credential and not to any guests of the bearer. The Hagerstown Suns reserve the right to revoke media credentials if Suns, South Atlantic League, or MiLB policies are not followed. Player Interviews/Accessibility: Special interview requests should be submitted to Shawn Murnin no later than 24 hours prior to the request date in order to best accommodate you. It is the player's responsibility to fulfill media requests once submitted. Access to players, coaches and clubhouse areas made available to the media will end one (1) hour prior to first pitch. There will be a minimum cool down period of 10 minutes following the completion of each game. In some circumstances, a longer cool down period may be required. Media are asked to respect this period and refrain from engaging players and coaches until the cool down period is fulfilled. 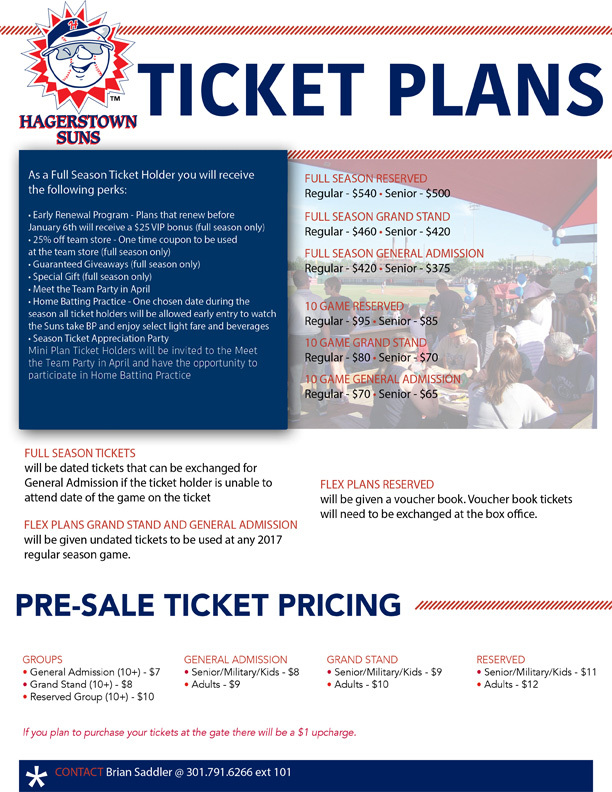 The Hagerstown Suns will make every attempt to fully accommodate all media requests following each game. Any and all live or recorded radio or television interviews or players or coaches must be approved by the Suns Director of Media Relations before being conducted and should be requested no later than 24 hours prior to the expected date of recording/air. Gameday Stats & Notes: Gameday stats, game notes, and rosters will be made available to media at the Fan Services station on the main concourse at Municipal Stadium prior to each game. Due to limited space in the press box, the fan services station serves as a more convenient and accessible pick-up location for these materials. Media Parking: Due to limited availability of parking resources, members of the media should notify Shawn Murnin if they are in need of parking no later than 24 hours before the start of that day's game. Media holding season credentials may park in the Suns Season Ticket Holder lot, with approved parking permit, provided by the Suns. Parking permits are to be utilized by working media only. Press Box: The Municipal Stadium Press Box is located on the roof of the infield grandstand seats, directly behind home plate. Access is gained through the spiral staircase located behind the last row of general admission seats behind home plate. Due to a severely limited workspace, media members are asked to limit traffic to and from the press box and utilize alternative seating in the ballpark grandstands. In some circumstances, overflow media seating will be made available. Any member of the media who may seek specific accommodations should contact Shawn Murnin no later than 24 hours prior to the game in question to ensure accommodations. Press Release Contact List: To be added to the Hagerstown Suns media contact list and receive all team press releases, please contact Shawn Murnin detailing your outlet and interest. Photographer/Camera Work Locations: The Hagerstown Suns request all photographers and videographers respect the fans by working in areas that do not interfere with fan sightlines. All credentialed photographers are to use the photographs taken for professional, journalistic purposes and are not permitted to use photos for commercial use. Photographers are not permitted on the field of play, in the dugouts, bullpens or on the roof during games. Photographers may work in areas that are publicly accessible throughout the ballpark. Photographers seeking special accommodations or subject requests should contact Shawn Murnin no later than 24 hours prior to the game date. Field Access: The working media is allowed on-field access during batting practice, up to one (1) hour prior to the start of the game. Media are allowed access to the infield grass areas in foul territory behind the first and third base bags and around the batting cage, not interfering with on-field activities. Media is not permitted on the dirt area at home plate, directly around the batting cage. Media is permitted in the dugout only during designated times of access and will not interfere with players and staff while conducting themselves in a professional manner. Media may be asked to relocate by the Hagerstown Suns staff and we ask that you please respect such requests. There will be no media access on the field during the game. Player Roster Moves: The Hagerstown Suns and/or Washington Nationals will notify the media of all roster moves via email press release. In the event of a roster move just prior to a game start, the email may be delayed. Player Status Health/Injury: Any inquiries about the status of player health and/or availability related to prior injury must be addressed by Suns Manager Patrick Anderson. Absolutely no member of the Suns staff is authorized to comment on player health, unless instructed by the Suns Manager or Washington Nationals. Media Meals: Members of the working media can receive a complimentary meal voucher at each game. Meal vouchers will be distributed only to working media by Shawn Murnin. Media members must be working to receive a complimentary meal. Abuse of this policy will lead to revocation of credentials. Any additional food items must be purchased at your own expense. No member of the working media will be served alcoholic beverages, nor are they allowed to consume alcoholic beverages during games. Autographs: Media, under no circumstances, are to seek or request autographs while bearing credentials at Municipal Stadium. Please conduct yourself professionally when accessing the ballpark as working press and respect the players and coaches of both teams.